Every year the Sci-Fi Media track puts on a Drive-in movie also called Heckle-a-Thon. This is one of the better events of the con. The first year it was in a pretty small room. Since then and every year since, this event gets bigger and bigger. Joe, Kelly and Kevin put on a great show. They have provided door prizes and even more importantly, they ALWAYS provide a good time. Think MST3K style. Lots of jeering and laughing going on through the whole thing. The movies that they play are amazing. They are usually B movies or movies that are found on the SyFy channel. 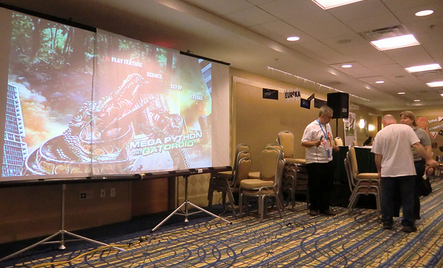 The movies that have been played are Sharktopus, MegaPython vs. Gateroid, Supershark and Mega Piranha. I might have missed one in there but I do not think so. These movies are so awesome. This is always a great time had by all and I encourage you to try it out one year. Found this on Flickr. Joe Kevin and Kelly setting up the Drive-in.